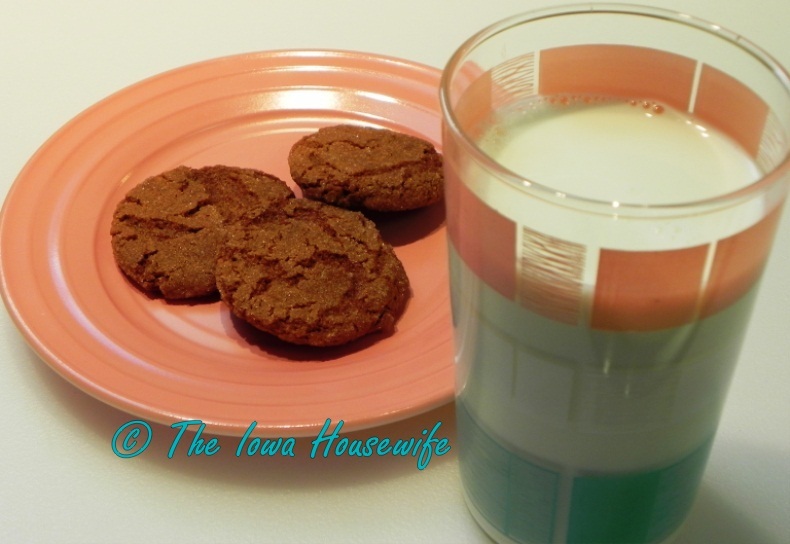 Milk and cookies – to me that means gingersnaps and milk in our Grandmother’s kitchen. She seemed to always have them on hand. They are low calorie, spicy, crunchy and just plain good. I liked this recipe for them from the "Fannie Farmer Baking Book." They seemed to be the closest to what I remember as a child - actually, they are perfect, crisp but not hard. This is a blue-ribbon recipe in my opinion. This is a simple, easy-to-make recipe – I agree with Myrna, I only dip the tops of the cookies in sugar. The tablespoon of ginger isn’t too much; I used Grandma’s Original molasses for these. I used a size 100 scoop to make the balls, and got about 4 dozen. Preheat oven to 350°. Grease cookie sheets or line with parchment. Beat together shortening and 1 cup of sugar. Add the egg, and beat until light and fluffy, then add the molasses. Stir and toss together the flour, baking soda, salt, ginger and cinnamon, and add to the first mixture, beating until smooth and blended. Gather up bits of the dough and roll them into 1" balls, then roll each ball in sugar. Place about 2 inches apart on the prepared cookie sheets and bake for 10 to 12 minutes, until the cookies have spread and the tops have cracked. Remove from the sheets and cool on a rack. Per Serving: 65 Calories; 3g Fat (42.8% calories from fat); 1g Protein; 9g Carbohydrate; trace Dietary Fiber; 4mg Cholesterol; 71mg Sodium. Exchanges: 0 Grain(Starch); 0 Lean Meat; 1/2 Fat; 1/2 Other Carbohydrates. I think I can not only SMELL these, but TASTE them, too. You've made me want to make these-- TOMORROW!!! (I always love to see the little crinkly sugar trails on their tops.) YUMMM-O!